In conjunction with the exhibition PLAY! Start with the breath. Feel yourself come into full presence with your body and with one another. You are entering a different kind of conversation—a dance in which the acts of speaking, listening, and responding are felt in the body and expressed in gestures of markmaking. Grab one piece of chalk in each hand. Sit side-by-side against the chalkboard with your legs forming a 90-degree angle. Straddle the centering line and place your feet hip-width apart, pointing forward. Your ankles should be directly below your knees, so that your lower leg is perpendicular to the floor. Press your sacrum (tailbone), back, and head against the wall. 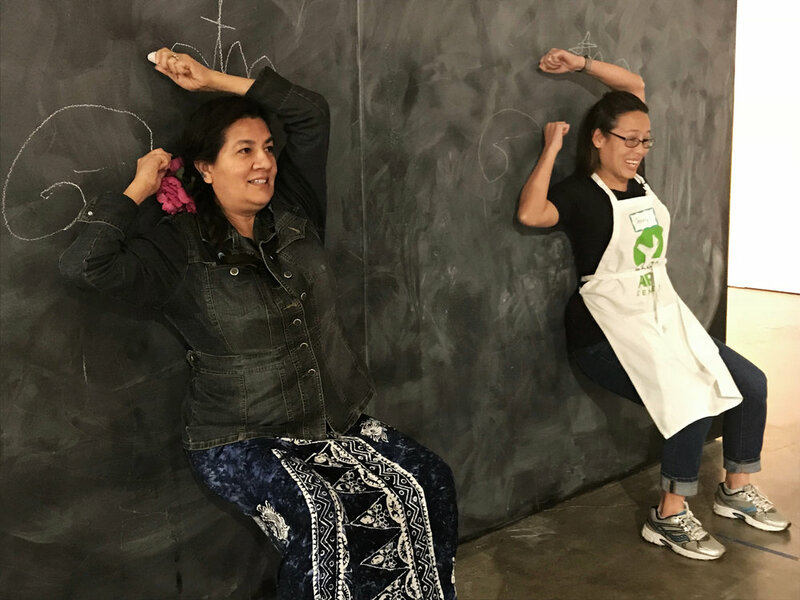 As you stay in position, playfully explore your range of motion and the possibilities of markmaking together on the wall behind you. Avoid the temptation to draw symbols like pictures and words. Move as one, mirroring each other’s movements as closely as possible. Synchronize. Be willing to both lead and follow and allow for those roles to switch at any time. As you go, the pain in your quadriceps will increase in intensity. As your discomfort increases, stay present with each other, support each other, and allow the discomfort to exist between you. Know that vulnerability is always present when people gather the courage to have a real conversation. Be playful in your expression as you explore the limits of your discomfort together. Push yourselves, listen to your body, and stop when you know it’s time.